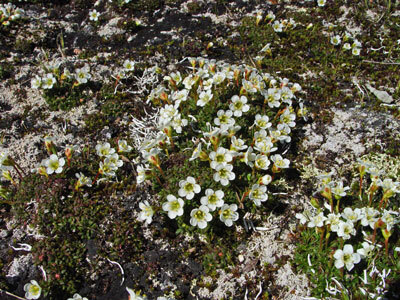 Habitat: Alpine areas, bare ledges and gravel [Alpine of subalpine (non-forested upland)]. Range: Circumboreal. South to ME, NH, VT, and NY. 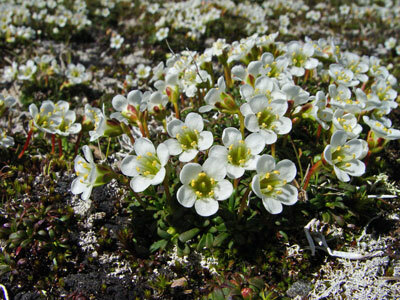 Aids to Identification: Diapensia is a tufted alpine sub-shrub with white 5-lobed flowers and opposite leaves. This species grows in very dense "cushions" and mats above treeline. The leaves are small and ovate in shape. Colloquially called a cushion plant. Ecological characteristics: Found above treeline on Maine's highest mountains. Grows on bare rock and gravel. 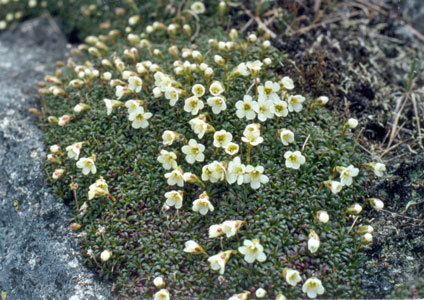 Maine's populations are Diapensia lapponica var. laponica. Phenology: Flowering June and July. Known Distribution in Maine: This rare plant has been documented from a total of 10 towns in the following counties: Franklin, Oxford, Piscataquis, Somerset. Reason(s) for rarity: Alpine habitat is scarce in Maine, at southern limit of range. Conservation considerations: Hikers should stay on trail and avoid trampling alpine vegetation.